One of the world’s most notable intraplate volcanic regions lies on the eastern Australian plate and includes two age-progressive trails offshore (Tasmantid and Lord Howe seamount chains) and the world’s longest continental hotspot trail (Cosgrove Track). While most studies agree that these chains formed by the rapid northward motion of the Australian plate over a slowly moving mantle source, the volcanic output along these trails, their plate–mantle interactions and the source of the magmatism remain unconstrained. A geophysical mapping and dredging campaign on the RV Southern Surveyor (ss2012_v06) confirmed the prolongation of the Lord Howe Seamount Chain to the South Rennell Trough, ∼200 km further north than previously sampled. Radiometric dating of these new samples at 27–28 Ma, together with previously published results from the southern part of the chain, indicate straightforward northward motion of the Australian plate over a quasi-stationary hotspot as predicted by Indo-Atlantic and Pacific hotspot models. 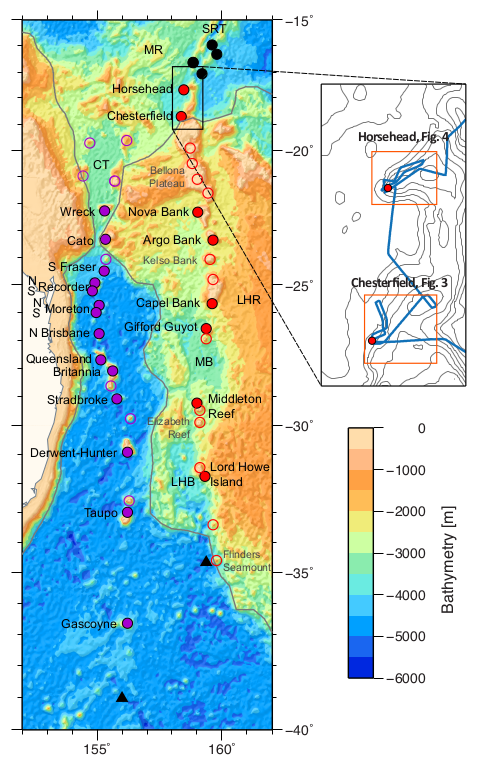 A peak in Lord Howe Seamount Chain magmatism in late Oligocene time, also seen in the Tasmantid and Cosgrove trails, matches a 27–23 Ma slowdown of Australian plate motion. The average magma flux of the Lord Howe hotspot is estimated at 0.4 m3 s−1, similar to rates of crustal production at the South Rennell Trough prior to cessation of spreading in middle Oligocene time, supporting a potential genetic relationship to this spreading system. In addition, plate tectonic modelling suggests that the seamounts and plateaus in the Coral Sea may host the earliest evidence of plume activity in the area. You can access the entire publication here.